Coastline Homes offers customers in Central and Down East Maine a full selection of homes by Commodore Homes, Kent Homes, Pleasant Valley and Premier Builders, with several models on our lot for you to explore. You can visit our Ellsworth Location page to learn more. Our normal business hours are Monday through Saturday, 8:00am to 5:00pm. Available Sunday by appointment only. Find Coastline Homes in Houlton using Google Maps! 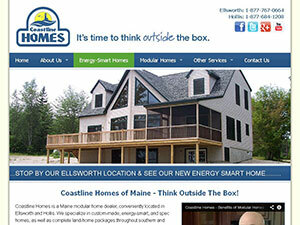 Coastline Homes' Houlton location serves many communities in Northern and Eastern Maine. This location offers a selection of homes by Commodore Homes, Kent Homes, Pleasant Valley and Premier Builders. You can visit our Houlton Location page to learn more. You can use the following contact form to email our sales team. Are you building on land you own, or are you looking for land to build on? What area of the state are you building in? If you heard about us through a referral, please let us know who it was. If you're not a robot, what is 700 + 3?